The home that you enjoyed together as partners is now being used to demonstrate the breakdown of the relationship…before you take steps that you could regret, take time to consider your position and what you can do. What is Property, and do I have Joint Ownership? When lawyers talk about property being 'jointly owned' in the housing context it means two or more people who hold legal title to the property. More often than not, this will be the family home. You will know if you have joint ownership if your name is on the legal title to the house, which is registered with the Land Registry. If there is still a mortgage on your property, the title deeds will be held by the mortgage company. If both you and your ex are named on the title of the property, both of you have rights over and to the property; this includes being able to change the locks. There is not a lot to stop an owner of a property changing locks. The problems arise when one joint owner deprives another of access to a property. 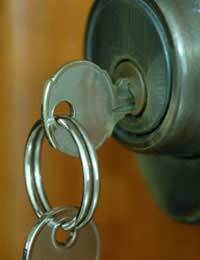 The most common depravation is if keys are not provided to the house once the locks have been changed. 1. A Polite Letter – Try writing a polite letter to request access. While this understandably might not be your first instinct it could possibly assist you, should matters need to escalate, if other methods of resolution have been exhausted before you embark on formal enforced access to the house. 2. An Occupation Order – In the case that you are still living in the home and using it as your residence, you may be able to apply to the court for an Occupation Order. If the Occupation Order is granted you will be allowed access to the property to live in the house, come and go and utilise the facilities. You will have to keep up payments for the mortgage or bills, most likely in the same proportions as before the breakdown of the relationship. If the locks have been changed, the relationship has broken down to such a degree that an Occupation Order will be a hardship for both parties. Occupation Orders are often very prescriptive, including but not limited to designated times for kitchen or bathroom access. However, this might be the only option for those parties unable to afford another property or those unable to reside with friends or family. 3. Ask the Police to Accompany You – If you are living elsewhere when the locks are changed following the breakdown of the relationship, you can ask the police to accompany you to the house while you remove items that are yours. You must be able to prove that you are allowed access to the property. Ownership of common items are likely to be disputed, so this is best sorted out away from the home environment, especially if children are likely to be there when you come over. Clothes, personal keepsakes and personal documents are usually the items that are removed. 4. Sell the House – Selling the house is usually the last option. This is not a light decision to make and, depending on where you are in terms of your separation proceedings, you may have already discussed this with each other. If you are unsure about taking steps to sell the home the advice would be to seek advice from a legal representative. There are many different orders and different personal circumstances will affect the decision taken. The courts' primary consideration will be the welfare of any children. The court will consider the need to keep the children in the most stable environment possible. This does not mean that they will ignore you or marginalise your concerns. Avoid antagonising the situation; storming round to the property and acting in an unreasonable or threatening manner is unlikely to endear you to a court. It may seem obvious but in times of emotional stress instinct has the tendency to override any other thoughts and you may act out of character. Take time to consider your options, and remove yourself from any situation that is likely to cause a confrontation, even if the other party instigated the argument. This is not giving in or backing down, but preserving your position and taking time to consider the most reasonable course of action. Financial arrangements part 1 and Part 2 then take a look at the sample separation agreement to see if this might work for both of you. I decided to finally move out of a joint home I have with my ex (after an incident. we had not been together for over a year anyway). We have a daughter of which it's 60/40 to me. We have a joint equal mortgage which we both paid equally. I still have some of my possessions at the house. I want to leave them there in my storage closet and room until the house is sold. Can he throw my stuff out ? can he force me to take my possessions out of the joint home just because I moved out? I'm also trying to force a home sale but he refuses. Hi, me and my wife have been married for 5 years, we have had a joint mortgage on the current home for just over 2 years. She cheated on my in which our marriage then broke down, she then carried on seeing the new guy whilst we were living together which was very stressful for myself. I then went to stay at my brothers as I could not handle living with her whilst she was with him. I was still paying all of the mortgage, she then abandoned the home to move in with her new boyfriend so I moved back in the house and carried on paying the mortgage to make sure we don’t lose the house. We are currently going through the divorce in which we are looking to sell, she has now changed her ways and is threatening to move back in with her partner even tho I am here and she has not contributed a penny, before and after the breakdown. We have a child which we have shared care for. This is detrimental to our child as it would be confusing for her to go though all this again. Is there anyway I can stop her from moving back and then just proceed to divorce and sell the house? HI.MY SON IS STILL ON THE DEEDS OF A PROPERTY WITH HIS EX WIFE. SHE WILL NOT SELL THE PROPERTY.HE OWNS A FLAT TOO, SO CANNOT BUY ANOTHER PROPERTY WITH HIS GIRLFRIEND WHO HE WANTSTO MARRY.CAN YOU SUGGEST ANYTHING? IF HE SOLDTHE OTHER PROPERTY, WOULD HE BE ABLE TO GET ANOTHER MORTGAGE? THANK YOU. Hi me and the wife seperated in Dec 17 after 17 yrs of marriage. she said she didn't love me anymore, we jointly pay the mortgage on our property and she's now filed for divorce on unreasonable behaviour. She said her solicitor has said she can change the locks on the property even without my permission, but everywhere I've read says she's not allowed to do so and I have the legal right to move back in if I wish. As im still paying the mortgage and also rent on a temporary house. And im struggling, I can't get legal advice in writing without paying in excess of £250 per hour which is frustrating! Where do I stand on this matter as she insists her solicitor is in the right to say she can change the locks. There is no history ofviolence,drugs,alcohol involved and no court order against me. You have the right to stay in the home if you're married, in a civil partnership or on the 'title deeds' the document that proves who owns your home, please see the link here. I live with my bf and my 2 sons of 19 and 24.He owns a third of property and me 2 thirds.He is an alcoholic who has been abusive verbally and a little physical over the years on many occasionsPolice called twice.Last year it all came to a head.... after he was arrested drunk and disorderly andbparticularly nasty to me and he gave up drinking.We carried on but in april he decided to drink again.Just a beer or two.At that point I decided I have had enough and it's over.I cannot go back to that unpredictable life as he us an Alcoholic who cannot drink in.moderatiin.I am going to remortage and buy him out.The problem is it will be a few months as I am waiting for some inheritance money to do this.So tonight he is very drunk and threatening.I do not feel safe in my own house. Had go bedroom holding door shut . My son came home early from his shift to make sure I am ok.My question is...can I tell him to leave.... with few weeks notice.And then if he doesn't do this change the locks.In sept my son will be back uni and the other wont be here. They are very worried to leave me as when he's drunk he will turn nasty.Grateful for any advice please. @some peope - it shouldn't affect your finances......but be warned she could go to court for an occupation order and once she is in the house if she is the main carer of your kids then she will be given preference. It puts you in a dodgy situation as a court can actually sign the house over to her until the kids are 18. Get some advice as she could be moving back....with an agenda. My wife moved out a year ago as she couldn't live with me anymore, me working 90 hr weeks and her going out with her friends all the time, not doing any housework or cooking for the kids was bringing her down. Her pre-separation London boyfriend who paid her rent when she moved out has decided he's not going to pay it anymore and she's told me she's now moving back in. Keeping her boyfriend and we will just live together. This is crazy as she has been violent towards me on occasions and I can't see anyway this can possibly work. However as it's a jointly owned property (trying to sell it at the moment) solicitor I can't stop her. I'm the middle of sorting out the finances, so this really isn't helping. If I change the locks will this affect the finances? I know I shouldn't but I just want to delay everything in the hope of finding a buyer before she moves back in. After the mortgage lender takes your property into possession they will sell the property for the best price that can reasonably be obtained. If the sale does not generate enough money to pay off the money owed to the lender, then you will find out the amount of money owed. A lender may or may not wish to seek repayment of the shortfall debt. @France's- not if the 'soon to be ex wife' jointly owns the property. My partner and I have split up two weeks ago and she has locked me out of my home. My partner and I have bought a house together with her parents and we were planning to all move there in July when an extension is finished. My partner and her two children, (aged 9 and 10), temporarily moved into my rented place in January this year. We had been together for 2.5 years and I decided to end it due to it being controlled too much.I rent this home from my mother, I pay all the bills for her and it is my registered address. I have previously removed some of my important items last week, but yesterday discover that she has locked me out - Does she have the right to do this?I have found temporary accommodation for a month and I have asked her politely to move out of the house to the new home, (which is perfectly OK to use as the extension doesn’t infringe on the main building), by the end of the Easter holidays. What can I do if this doesn’t happen? What are my rights here? How do I get the property back?Kind regards, BTM. As outlined in the article, a letter giving your ex a deadline should be sent. A solicitors letter may have more impact here. If your ex ignores you, then you would have to apply to court for an occupation order. It is highly likely you will get your house back. However, it will cost if you have to take the matter to court. My partner and I have split up two weeks ago and she has locked me out of my home. My partner and I have bought a house together with her parents and we were planning to all move there in July when an extension is finished. My partner and her two children, (aged 9 and 10), temporarily moved into my rented place in January this year. We had been together for 2.5 years and I decided to end it due to it being controlled too much. I rent this home from my mother, I pay all the bills for her and it is my registered address. I have previously removed some of my important items last week, but yesterday discover that she has locked me out - Does she have the right to do this? I have found temporary accommodation for a month and I have asked her politely to move out of the house to the new home, (which is perfectly OK to use as the extension doesn’t infringe on the main building), by the end of the Easter holidays. What can I do if this doesn’t happen? What are my rights here? How do I get the property back? Kind regards, BTM. @Mark - If the house is jointly owned, then you have every right to move into this house. If your ex objects she can take you to court. But I'm sure the court wouldn't object. It's unlikely your ex would go this far anyway. Hi, i've just split from my girlfriend (never married or engaged) of 6 yrs, we have 2 kids together (one is 2 & the other is 4). I understand she can take possession of the house. (even though she's not on the mortgage or on any of the bills as I took care of everything, all in my name.) My question is, when/if she takes the house, it's until the last kid leaves home at 18, then I get custody of it back. So in the meantime does she have to pay me rent to live in the house and pay the bills and general maintenance etc, or basically do I have to keep paying everything until the kids are 18 and she lives rent free? If this is the case then I may have to go bankrupt which obviously isn't a good thing. As i'll be left with no way to pay for food or bills or rent for a new place. So i'll at least be made homeless out of it if she takes this course. Also what if she moves a new partner in? If you cannot agree on what you should do with the home, or how you should make arrangements, then mediation may be an option to consider. There is no black and white answers here. So, you both have to try to decide what is in your children's best interests. If you don't, then the matter can end up in court and it will be the court who will decide on you/your partner's and most importantly, your children's behalf. I have my own home , no mortgage, I then married an English lady abroad . (The marriage certificate is from another continent) .My wife obviously moved in to my home & never wanted to work, I am on the min wage supported by Working tax credit, been married 8 years. and have a young child . My wife has taken off refusing to tell me where she is or when she will back and told me not to contact her. Does she have a right to stop me from seeing my child ? Does she have a right to a fiscal share of my homeetc. ? How long do I have to keep her belongings in the home ? Your only recourse would be to seek legal advice regarding this matter, as unless you can solve the matter mutually with your ex, you would have to take it to court. Unfortunately, we can offer no more information than the article gives. Your daughter would have to seek legal advice in order to apply to court for an occupation order. Much depends upon the reasons why your ex feels he may be justified in asking for a more than equal split. However, if the marriage has been long, and you have two children between you, then you are both entitled to your equal share of the marriage pot. However, it is impossible to answer without fully knowing the reasons why your ex is requesting more. Therefore, you may wish to seek some legal advice.